Elisabeth is here today from the Advisors Circle. She recently stopped by to share her favorite Oliver + S pattern and her Henley T-shirt Tutorial. Now she’s here with her latest make, and she is going to give you the scoop. 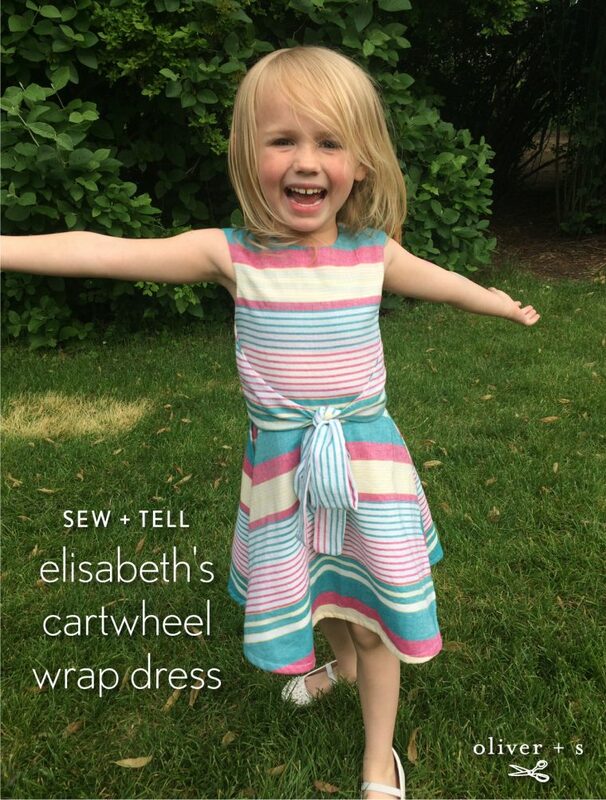 Pattern used: Oliver + S Cartwheel Wrap Dress, view A. Absolutely! The lawn I used was a lighter weight for the summer. The bodice on this pattern is already lined, but I did baste plain white lawn under the main skirt pieces (not the extension) because it was fairly see-through in the white portions of the stripe. This pattern is so much fun to sew! I wasn’t quite sure how the dress all fit together on my first look, but as soon as I figured it out it was really exciting. It was also a great bonus that all of the sizes are on one pattern. 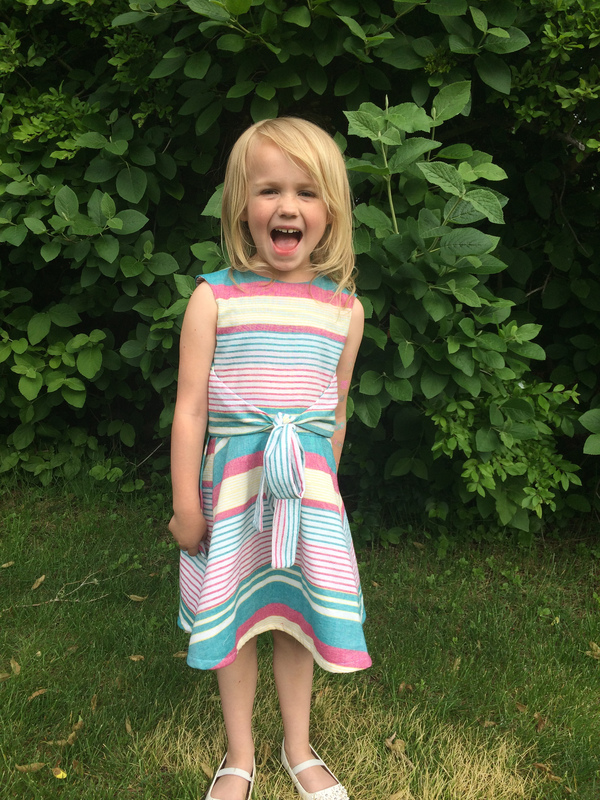 My daughter’s measurements put her in a size 4, but she needs a 6 for length, so I loved having them both there! 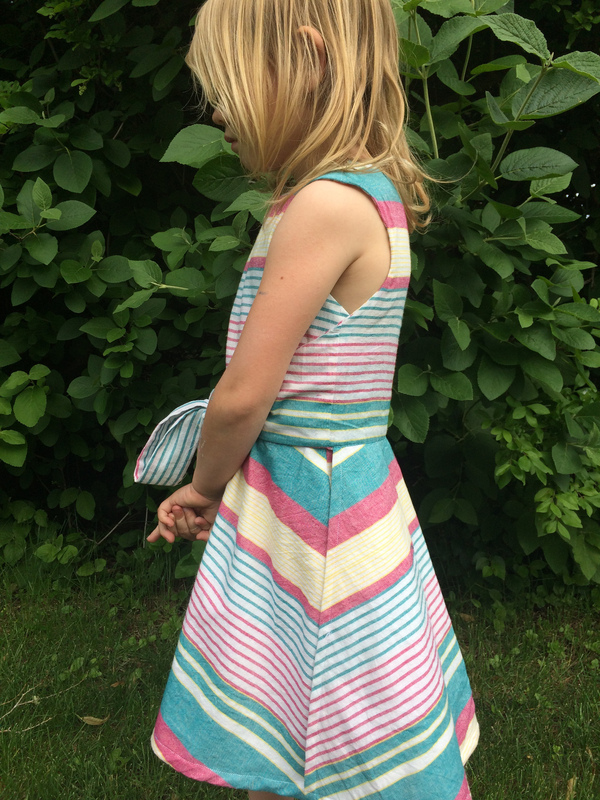 Because I used a striped fabric, I had to be careful in my cutting to have the stripes line up on the main bodice pieces and also the wrap, and then also the main skirt pieces. Everything goes together so nicely! The best thing is that my daughter loves it. She loves the bow in the front, the way the wrap dress works, and that the skirt is very twirly. I also ended up being very fond of the way the stripes come together at the side of the skirt. Using a horizontal fabric gives you a chevron effect at the sides that is really eye-catching. Dress is so cute, and your daughter looks adorable. it is really cute. I love the way the stripes came out. This is killer. Great fabric choice! !